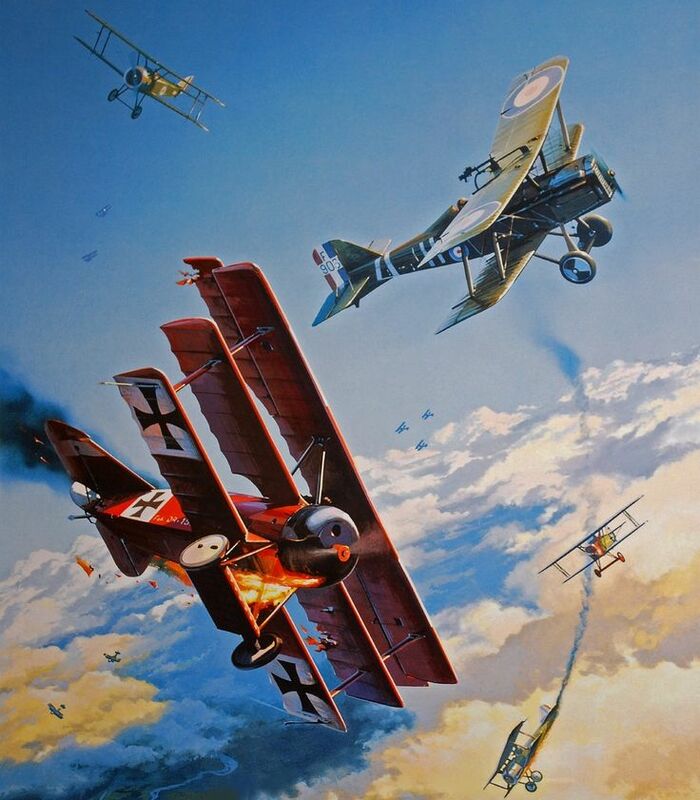 World War One saw the birth of aviation as a concept in military warfare. As new army branch, aviation developed quickly as its inherent advantages were soon well-understood. Although not as decisive as it was in WW2, aviation saw the creation of the three types we know today: Reconnaissance aircrafts, Fighters, and Bombers. Everything was set up, from the ancestor of the Stuka with the Junkers J-1 to the Handley-Page I/400 heavy bombers, ancestors of the Halifax bound to Germany, the first aces, first ship-borne air attacks, first written tactics and an embryo strategic doctrine. Outside a technology leap, this was also an industrial battle that reflects wildly diverging production strategies, and explains the outcome of ww1. The "war to end all wars" first saw the appearance of the aircraft as a player in the battlefield, a transition from fragile assemblies of wood and canvas to a war-winning mass industry. In the foreground, the plane occupied little more room in the staffs of all countries than the previously experienced balloon. Means of transport to pass over enemy troops without danger and means of observing the enemy movements with remarkable acuteness, reserved a role outside traditional light cavalry brigades. Outside the lack of direct communication with friendly lines, a certain slowness and reduced agility were real problems in operations. Pioneers from 1895 were perceived only as eccentric daredevils, which feats were completely disregarded by armies. However, already, aviation pioneer Clément Ader had proposed his "avion" to the authorities, but collected little attention. Blériot, Garros, and naturally the Wright brothers among others, also demonstrated that the machines were reliable to a certain extent. It was Blériot who, in 1910, provided by his channel crossing the live demonstration of a basis for a working reconnaissance plane, a solution which palliated the principal defects of the balloon (which was used anyway during the war to a great extent, from observation points to sky blockade, maritime patrol or long range bombing (airships). The airship could perform also reconnaissance but was very expensive in comparison (a fraction of the price of a battleship) and still relatively slow. The Balkan War in 1910 was to be the first field of experimentation of military aviation. The first air bombing, if we believe some sources, were performed at low altitude (with infantry grenades). Through observation, planes proved a certain efficiency in this role. But reliability of engines was still often in default, as was their laughable autonomy. Manufacturers just getting started then tickling with aircraft engines. Synergies between engine motorcycles manufacturers, and later automotive industry with aviation, allowed massive conversion to war economy. They would open a new market and divert considerable brain and material resource to improve aircraft propulsion during the great war. This was such a leap forward in tech, that postwar civilian engines for cars, especially sportscars, has been greatly influenced by aircraft manufacturing (former aircraft manufacturers also partly converted back to cars after the war). In 1914, the various countries involved in the conflict thus have an embryo of military aviation, attached to the army. That unit was not yet recognized as an independent weapon, but a means of information to a local front staff, tracking enemy movements on the battlefield with more efficience than cavalry. Only with the diversification of military types it was possible to gradually gain an organic independence from the army. France in August 1914, had by far the largest number of military aircrafts: 216 spread between 27 observation squadrons. These were exclusively unarmed reconnaissance aircraft, most being of the Blériot XI type. As such, the military pilot license dated back from 1911, and a law of March 24, 1911 devoted military aviation as one of the 5 components of the army (Infantry, Cavalry, Artillery, Engineering), at least in France. This aviation could actually include both balloons and kites. But as it has been foreseen this "fifth weapon" began to appear as an offensive element when a first aerial fight took place on October 5 between a French aviator and a German pilot. By then cavalry carbines and pistols were used. But already some did not hesitated to use the most diverse objects and contraption, the most mildly appreciated of which was unquestionably the grappling hook... which inflicted delicate architectures of wood and canvas quite amounts of damage. From then on, the machine gun naturally emerged a weapon of choice. The first were mounted above the main wing: To fire, the pilot had to stand in his seat, blocking his stick between the knees, shooting over the propeller radius. But this was of course not ideal. Thus placing it to avoid the field of the propeller became a new urge. While a new type of subdivision of the army air corps appeared, the fighter, the machine gun eventually ended on the hood for more efficiency. At first, bullets ricocheted on armoured propellers tips (Garros solution), but soon a mechanism was developed to fire synchronous with the pitch, using in particular oil drip system invented by Fokker. Hence, the first "Fokker scourge" began in 1914 with the Eindecker using this device. It was found more logical to aim the entire plane at the target. In 1915, the air force was officially subdivided into bombing, observation, fighting, transportation and training. French production was then renowned throughout the world, with Clerget, Hispano-Suiza, Le Rhône engines massively built or acquired under license by allied manufacters and... enemies alike. The fabled Von Richtofen's Fokker DR1 was equipped with a rotary that was a copy of a Le Rhône model. The Nieuport, will form with these engines the spearhead of the Allied aviation, the Nieuport 11 becoming the standard fighter used by the French as well as the Brits and the Italians.The Rotary engine, turning with the propeller was the ancestor of the star engine. Its simplicity and robustness destined it naturally to mass production, but in return its power was limited to about 250 hp. It was not enough for the fighters coming out in 1916, especially when the Germans were using large numbers of online engines, blending in the fuselage and making the aorframe sleekers and the planes much faster, a crucial advantage in air combat. This was the era of the terrible "flying circus", almost a total eclipse for Allied aviation, particularly in April ("Bloody April"), whose situation will only recover from May-June 1917 with new generation fighters like The SPAD VII (French) and Sopwith Camel and SE.5 (UK) finally able to restore the balance thanks to online engine (Hispano-Suiza) or better agility (Sopwith Camel). Opposite, the German Albatross D III, Pfalz D II, among others ruled, but industrial production figures still were largely in favor of the allies: The Spad was declined in 6000 copies, together with 5500 Camel and about the same number of SE.5, pitted against 1600 Albatros DV and 2500 Fokker DVII. The German industry was more scattered, with many more models. The Great war saw, all comparisons held, perhaps the fastest technological advance in aviation of anytime, anywhere. A good point to describe this is naturally ww2, for a start: The Messerschmitt 109, created in 1936, flew from the first day to the last of ww2 as frontline fighter, same as the British Spitfire, although both saw a great number of variants and improvements over the years. For raw power alone, the 1945 versions of these planes were almost twice as powerful as their original 1936 counterparts. However in ww1 fighters were obsolete in about a year and a half. In the Vietnam war, closer to us, the war started and ended around 1961-1973 (direct US involvement) with the F4 Phantom fighter bomber, Mig-21 and others were already old (1958 F4, 1959 MIG-21). Of course this also reflects the simplistic technology used on these early birds versus the gigantic resources needed and overall sheer complexity of more modern ones, with lengthy programs (like the infamous F-35 Lightning II, started in 1996 and still going on).